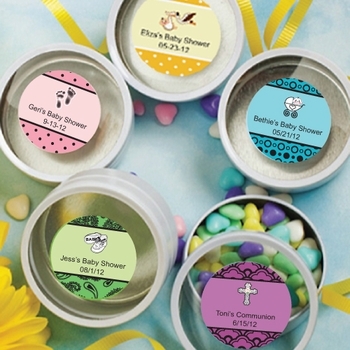 These cute tin favors are perfect for new baby showers! Available in either silver or white finish. See More Images above. You'll have fun filling these with your choice of treats, and your guests will leave with an adorable reminder of your baby's special day! Personalize the custom labels from a wide range of colors and designs to compliment the theme of your party. Choose the silver or white tins by selecting the color from the drop-down box under the "Need by date" shown to the right. The tins arrive to you bulk packaged with your personalized, self sticking label sheets included. Note - Assembly required: You apply stickers to each tin. Each tin is round and measures 2 inches in diameter by 1 inch tall. It features a metal base and a clear plastic top prepared for your custom designed label. I was surprised at the fast shipping. ProsThe made a nice favor for my granddaughter Baptism.